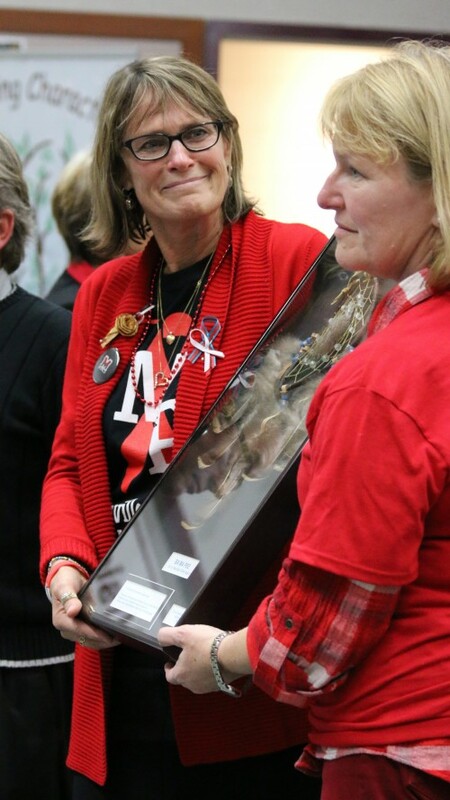 Marysville-Pilchuck High School Interim Assistant Principal Lori Stolee and Interim Co-Principal Deann Anguiano take possession of the dreamcatcher, Monday, Nov. 3, 2014, at Marysville School Board District office. 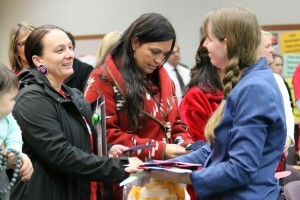 MARYSVILLE – Following a tradition set by survivors of the Columbine High School shooting, the Marysville School District and Tulalip Tribes were presented a dreamcatcher symbolizing survival, on November 3. During a modified school district board meeting, representatives from Sandy Hook Elementary and delegates from the Red Lake Nation in Minnesota gave the dreamcatcher and shared their story of healing. 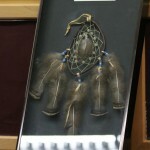 The dreamcatcher was gifted to Columbine High School in Littleton, Colorado, following a shooting that left 13 people dead in 1999. It has since been passed onto other school districts that have experienced similar tragedies and evolved into emblem of healing for survivors. of 26 children and adults. “I hate meeting people like this, but we came because we want to offer our support. 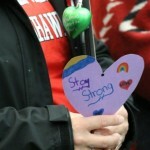 We know what they are going through,” said Oakgrove. Sandy Hook Elementary representatives Susan Connelly, Newtown Middle School counselor and Stephanie Hope Smith a member of the Newtown Rotary Club, spoke about the sobering baton that connects the schools. “We are united in hope. I’m sorry we are united in grief. I’m sorry we have the experience and expertise to share,” said Smith. “This plaque is more than just a dreamcatcher. It is made with such love. It is our hope that you should never have to pass it onto another community,” said Connelly. Also present during the meeting was Marysville School District Superintendent Becky Berg and board members Chris Nation and Tom Albright, Marysville Mayor Jon Nehring, Marysville Police Chief Rick Smith, Marysville-Pilchuck High School Principals and Tulalip Tribes council members Deborah Parker and Theresa Sheldon. This entry was posted in Local News, Tulalip News and tagged Becky Berg, Chris Nation, Deborah Parker, Dreamcatcher, John Oakgrove, Jon Nehring, Marysville School District, MPHS shooting, Red Lake Nation, Rick Smith, Theresa Sheldon, Tulalip Tribes by admin. Bookmark the permalink.